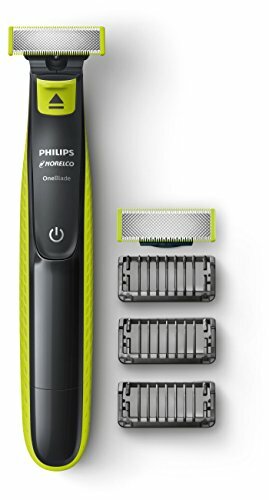 The Philips Norelco One Blade is a revolutionary electric grooming technology designed for men who wear facial styles, beards, or stubble. One Blade trims, edges, and shaves any length of hair. The unique One Blade shaving technology integrates a fast moving cutter (200x per second) with a dual protection system to give you an efficient comfortable shave on longer hairs. One Blade does not shave too close, so your skin stays comfortable. The replaceable One Blades last up to 4 months (For best shaving experience. Based on 2 full shaves per week. Actual results may vary.) One Blade comes with a 45 day risk-free trial and a full 2-year warranty. What's in the box: 1 Handle, 1 Blade, 1 Bonus replacement blade, 3 Trimming combs, 1 Power charger. Bonus pack includes 3 blades: 1 for your face and 1 for your body, plus a free bonus replacement blade ($12 value based on QP220/80 MSRP). Rechargeable One Blade Face + Body can trim, edge, and shave any length of hair. Shave is not too close so your skin stays comfortable. Shave is not too close so your skin stays comfortable. 3 click-on stubble combs deliver a fast and easy trim.